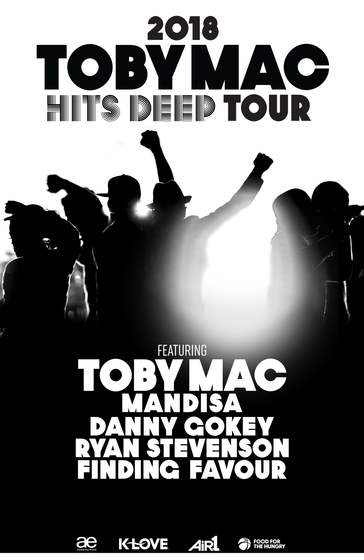 Seven-time Grammy® winner TobyMac will once again bring his dynamic HITS DEEP Tour to 29 markets next year, alongside a talent-packed line up including Danny Gokey, Mandisa, Ryan Stevenson and Finding Favour. The 2018 HITS DEEP Tour is a partnership with K-LOVE, Air1, Awakening Events and Food for the Hungry. Kicking off at Oklahoma City’s Chesapeake Energy Arena in late January, the HITS DEEP Tour will wrap in mid-March after stops in San Diego, Denver, Seattle, Minneapolis, San Antonio, Birmingham and more. Tickets for the 2018 tour go on sale Friday, Sept. 29 at 10 a.m. local venue time.